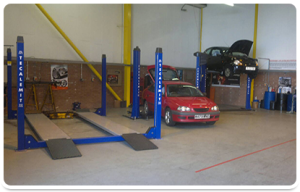 Have your car MOT or service done by qualified professionals in a relaxed and friendly environment at Colin’s Tyres. Colin’s are proud to offer our mobile tyre fitting service in order to keep our customers on the road. Colin’s tyres provides a quick and efficient breakdown service to help our customers in times of crisis. With a friendly team and service with a smile. 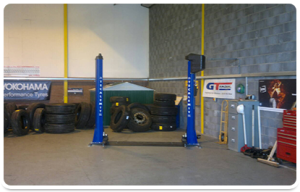 Colin’s tyres are proud to provide our customers with a one stop shop for their vehicles up keep. We have a great team in place who are fully qualified to carry out MOT’s and servicing along with any vehicle maintenance and repair our customers need to keep their vehicle running even if it’s only a puncture. Colin’s stock a wide range of tyres, alloy wheels, exhausts, brakes and even batteries but we can also order parts in for any customers who wish for specific brands. Once we have fitted your new tyres we can also take care of the balancing and wheel alignment along with any necessary safety checks to make sure you are ready for the road. Now that we are in the midst of winter it is important to make sure your vehicle is road worthy. With black ice, snow and high winds it is a good idea to have some good quality winter tyres fitted to help your vehicle grip the road and reduce breaking distance. 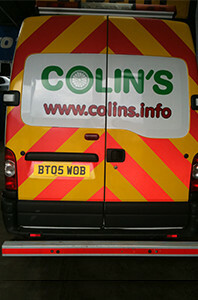 Another service we offer at Colin’s is our fast and efficient break down service. During the winter months the roads are pretty dangerous but don’t worry, we have you covered. We offer this service to both individual drivers and also to fleet vehicles. Mobile tyre fitting is another service we have been providing since 2011 in order to help our customers who have been stranded by a flat tyre or even puncture. We don’t just cover cars with this service though, we also cover commercial vehicles, light trucks and even forklifts. After all every customer is important to our team. Our team are also motor bike enthusiasts and in 2010 we were licensed to perform Mot’s, services and general mechanical repairs on motorcycles by VOSA. With all of the services we provide, why look any further. We look forward to hearing from you soon. Make sure your car is ready for the icy conditions with a winter safety check at Colin’s tyres. We’ll check your vehicle over and make you aware of any work that may need to be done. If you are calling for a quote on tyres please make sure you have all of the specifics such as the size, vehicle make and model. We will then get back to you with your quote. Is It Time For Your Yearly Service? If your car is 3 years old or older you are requires to have a yearly service to make sure the vehicle is in peak condition. Give us a call today and we’ll take care of it for you. Our expert team are always on hand to take care of any mechanical repairs on your vehicle. We take great pride in our work so only quality workmanship leaves our garages. If you need assistance with any of our services please feel free to contact a member of our team. Colin’s can help with tyre’s, exhausts and a number of other automotive services. Colin’s also provide a mobile tyre fitting and breakdown service should you require it.